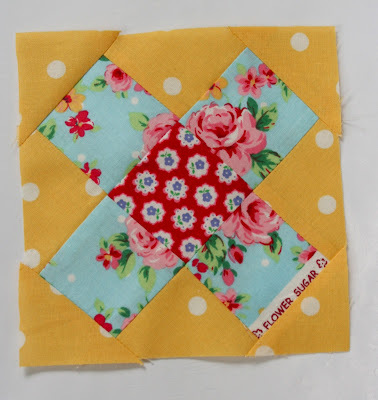 My sweet friend, Trish, from Notes of Sincerity posted a tutorial for the Granny Square block the other day. I knew right away I had to try it. I love little quilt squares and this one measures 6 1/2" unfinished. The first one I made using my stash of Lecien's Flower Sugar. 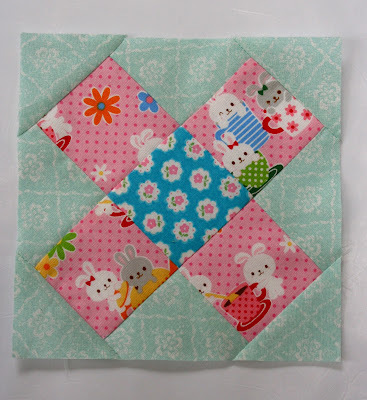 I was even able to incorporate the selvedge edge into the block, an idea I just saw on Kristyne's blog Pretty by Hand. The blocks came together quickly and easily. Trish's directions were very detailed and I really appreciated the tip on how to measure and square off the block, something I struggle with at times. I hope to make a couple of blocks every time I sit down to sew and before long I'll have a pile of pretties to stitch together. Be sure to stop by Notes of Sincerity for other inspiring creations. Trish also has a good list of bloggers as well. She has become such a dear friend to me and it's so fun thatl she is venturing into block tutorials. I'm heading over there right now. Your blocks are so cute. I have been seeing the granny square block all over Pinterest. With a good tutorial, I am inspired to try it. Only 6 1/2", oh my, that will take a lot of squares to make a quilt. Maybe a table topper to start with. Hi Renee. Your blocks look fabulous! The material you use is so pretty! Sweet as can be! Lovely sewing and darling prints!